HEXIN GLASS (www.hexinglass.com)Acid Etched is produced by Acid etching the glass to form an obscure and smooth surface. this glass admits light while providing softening and vision control. our innovated technology could make really nice acid etched glass. it has a distinctive,uniformly smooth and satin-like appearance. As a translucent product, it admits light whilst still providing obscuration and vision control. Designer can use the acid etched glass to created unforgettable setting for kitchen, bath,office and other spaces. Interior decorators can use it to create elegant partitions,staircases, door,mural, shower enclosures and more.Architects can us it to striking effect in windows, roofing and walls wherver their vision takes them. the versatillity of acid etched glass is as vast as your imagination. Etched glass is a timely process that allows us to put your ideas on glass, there are several effects that can be achieved with etched glass. Your imagination is the only limitation, we can do any design and concept. 1) A custom design is drawn to your specification. Upon your approval, our artists will enlarge the design to the full of size of the glass, then apply a rubber resist to the glass and transer the artwork, after the desing has been applied our artists will cut out the design. 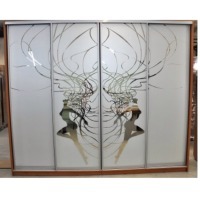 2)it's time to start blasting the image into the glass, a process that can take several housr depending on the design, and finally, your new custom etched glass is clearned, ready for installation. 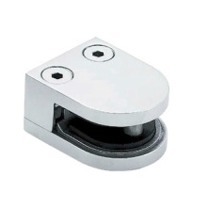 QUALITY STANDARD In accordance with CE EN12150 standard. In accordance with BS6206 British Standard In accordance with AS/NZS 2208:1996 safety glazing standard In accordance with ANSI Z97.1 CPSC 16 CFR 1201 Standard In accordance with GB 9963-1998 Clear tempered glass Standard. HEXIN GLASS Acid Etched is produced by Acid etching the glass to form an obscure and smooth surface. this glass admits light while providing softening and vision control. our innovated technology could make really nice acid etched glass. it has a distinctive,uniformly smooth and satin-like appearance. As a translucent product, it admits light whilst still providing obscuration and vision control. Designer can use the acid etched glass to created unforgettable setting for kitchen, bath,office and other spaces. Interior decorators can use it to create elegant partitions,staircases, door,mural, shower enclosures and more.Architects can us it to striking effect in windows, roofing and walls wherver their vision takes them. the versatillity of acid etched glass is as vast as your imagination. Etched glass is a timely process that allows us to put your ideas on glass, there are several effects that can be achieved with etched glass. Your imagination is the only limitation, we can do any design and concept. 1) A custom design is drawn to your specification. Upon your approval, our artists will enlarge the design to the full of size of the glass, then apply a rubber resist to the glass and transer the artwork, after the desing has been applied our artists will cut out the design. 2)it's time to start blasting the image into the glass, a process that can take several housr depending on the design, and finally, your new custom etched glass is clearned, ready for installation. QUALITY STANDARD In accordance with CE EN12150 standard. 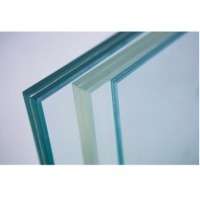 In accordance with BS6206 British Standard In accordance with AS/NZS 2208:1996 safety glazing standard In accordance with ANSI Z97.1 CPSC 16 CFR 1201 Standard In accordance with GB 9963-1998 Clear tempered glass Standard. Glass partitions represent a very good designer solution. They visually extend the room space and improve movement of light. Fully transparent all-glass partitions and doors can be used in office, production and trading premises as well as for facade shopwindow glazing. Furthermore, translucent structures can represent different models: various degrees of mattness and tint, decorated with fretwork and logos. Stained-glass windows are most popular of them. Glass partitions are fabricated of up to 20 mm thick shutterproof tempered glass, which improves the light flux up to 85%. Glass Partitions Provide The Following Advantages The all-glass partitions represent an advantage in that they do not visually cumber the rooms or obstruct the light flux. The all-glass office partitions and doors are secured to walls and ceiling with special fasteners; this is an advantage compared to frame-type translucent partitions as their installation takes less time and is easier, plus there is no need to use non-transparent fastening elements. A glass partition today is not only a cost effective and convenient but also a lovely item. Such partition will fit just nice into the interior. Office glass partitions installed in premises allow deploying a big number of employees due to the better noise suppression. This helps improve the psychological environment and ensure it benefits the productive teamwork. 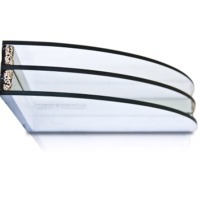 The thick shutterproof glass keeps warmth inside and creates a cozy atmosphere to each employee’s request. The glass partitions and doors are durable, heat-resistant, require no maintenance and are virtually safe. Short on time? Let glass-partitions sellers contact you. The partition glass can be used as a room divider, as partition between any 2 different rooms and it is available in both opaque and semi transparent or transparent form. It can also be used as a designer partition glass.The designs created are fully upon the customer's choices and selections. The glass used can be tempered glass or non-tempered glass. It is also available in multi-color, 2-color or monochrome as per client's suggestion. A winter garden represents a special architectural element with glass walls and roof and is decorated with various decorative plants Year over year there are more country mansions and cottages with special attention to winter gardens. They can give certain flair to the indoor scene and become a lively garden-like place for cozy pastiming and enjoying the beauty of the nature. Winter gardens of different price can be erected as an individual building or a part of a house, housing different plants of different sizes. It is quite problematic and not worth to build a garden on one’s own, so you can easily use our company’s services and order one. Main reasons why Karvan-Glass: 1. high material quality guarantee; 2. excellent design; 3. short order delivery time. It is not a secret that the appearance of a house is a sort of a business card for its owner. Embarking on a quest for an architectural solution for the façade of our house or office, we intend to benefit from the uniformity of style, beauty, practicability, and safety A sun breaker or shed is one of key elements of a building decoration which protects the porch or balcony as well as people who like spending time there from the snow, rain and other elements. Insignificant at first glance, but quite important in reality – the element like shed should be not only exquisite and stylish but also strong and safe. And the glass sun breaker from Karvan-Glass is something that satisfies all these requirements. For glass today is a state-of-the-art, stylish and strong material widely used in construction and design. If you want to decorate the building exterior in an unusual style then glass sun breakers are your choice – buy them from our company and satisfy your boldest architectural needs, benefiting from all advantages the state-of-the-art construction technology can provide. Translucent structures represent a convenient, functional and stylish decoration of various types of buildings and facilities. They look pretty well with business centers, shopping malls, and administrative buildings. They boast a light and elegant appearance but still maintain a serious yet fine exterior. The translucent structures enable to save on artificial lighting as they let in more sunlight. These structures are built using highest quality glass panes, which renders them, even greater advantages, namely noise and heat insulation as well as power saving ability. Translucent structures are about filling both horizontal and vertical planes of a building or facility with glass panes above an aluminum façade. Glass facades from our company represent minimum costs with always-high quality and versatility of designer solutions, which is a decisive factor for most satisfied customers who have already chosen Karvan-Glass. The all-glass enclosing structures of elevator shafts provide the main advantage of perceptible fragility and exquisiteness combined with guaranteed reliability and long life. 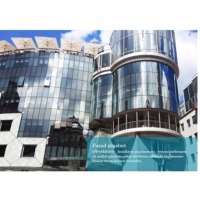 The panoramic glazing of elevator shafts with architectural shutterproof glass (which is more commonly referred to as a panoramic elevator) has an advantage to conventional enclosed shafts. The main type of elevator shaft glazing Karvan-Glass apply is point glazing: glass is attached to the bearing structure made of stainless or construction steel using point fittings specially designed to compensate for dynamic loads that occur during operation of an elevator. In doing so, the maximum transparency is achieved. 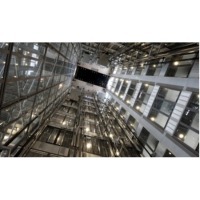 The versatility of elevator shaft designs using architectural safety steel is virtually unmatched among other materials. It ranges from full transparency which gives a panoramic view to passengers in an elevator through to modern photoprints on glass capable of embodying any designer’s concept. For instance, hidden glass fittings enable to create a solid structure that shares concept with the decorative glazing of walls. Glass doors are the integral part of architecture today. This is a fantastic choice for any kind of premises, from business centers through to apartments. One may think glass is not a strong material, but it is a misconception. 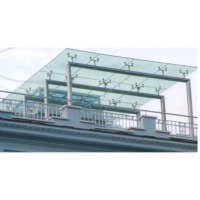 Tempered glass manufacturers have long been offering the product that easily provides a good heat and noise insulation and boasts an outstanding strength and long life. Broad product range The broadest selection of glass doors, fittings and door cases enables to pick a door for any indoor scene. Quality High quality glass from world’s top manufacturers. Simplicity Leaf made of environmentally friendly and easily maintainable material. 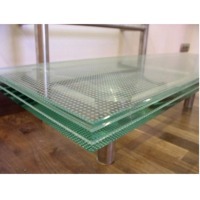 Safety Safety in use – tempered glass is very strong and does not form sharp splinters if broken. Long life Always the same appearance throughout the life. 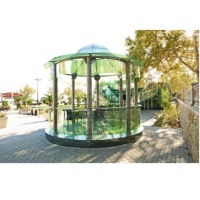 Glass arbors, just like arbors made of more conventional materials, are a fine choice for their key function, which is providing comfort in a garden or a park. Among advantages of a glass arbor: the glass structure can be opening type, so your can rest in an open arbor and enjoy fresh air and flower scent while the weather is good, but hide behind the glass if it aggravates; you can enjoy watching the environment through the translucent façade without perceiving the thin boundary in between; the arbor glazing is a great protection from the weather and wind without impairing the feeling of ‘being in the wilds’; the laced and transparent structure of an even big arbor will not create a visual impression of obstructed space in your garden. What are the design features of glass arbors? The most widespread type of arbor glazing in modern construction is either shutterproof glass of different thickness or safety glass. 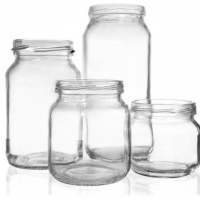 This material has a number of undisputable advantages: high strength which enables to withstand big wind loads and humming blows; safety in operation which guarantees no cuts in case the glass is broken after all; long life.